With all the white on white happening in the studio kitchen right now (white cabinets, white countertops, etc), I really wanted a pop of color (and pattern) for the backsplash. But instead of spending a whole lot of money on custom cement tiles, I decided to create my own. Sort of. 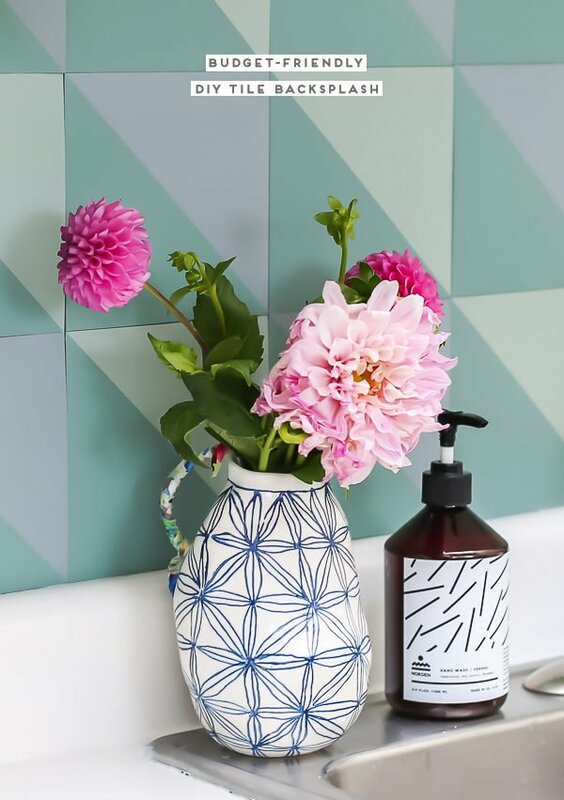 I teamed up with 3M and ScotchBlue™ Painter’s Tape to create a super budget-friendly tile option that mimics the unique patterns of those oh-so popular cement ones, using…..wait for it….peel and stick vinyl tiles. 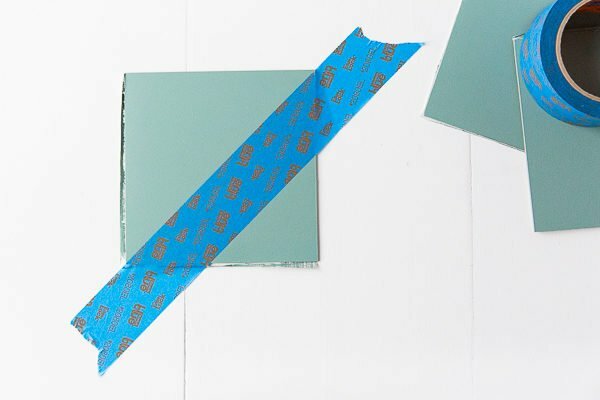 This DIY route may sounds a bit strange, BUT I saved a ton of money and was able to create the exact color combo and pattern I was hoping for. Not bad, considering it only cost me $50! Real quick, before the tutorial, let’s talk budget! 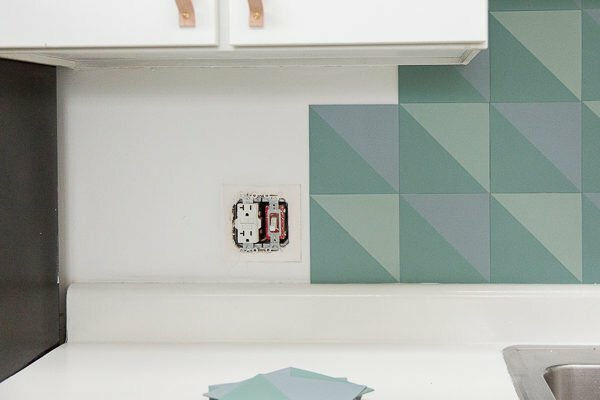 The total cost of the materials for this project came in under $50 and since it’s peel and stick, I was able to install the tile myself (which took about 2 hours once the tiles were ready to go – super easy). The total cost of cement tiles I had my eye on were over $650 for the square footage I needed AND they would have had to be professionally installed since I don’t know how to lay tile and grout (yet – I really want to learn). The price difference was WAY to good to pass up. In case you’re curious, I do plan to make bigger changes to the kitchen eventually (change out the countertops for quartz or butcher block, get an under-mount sink, a new faucet, etc. For now though, this feels like a good solution. Above is a side by side before and after. 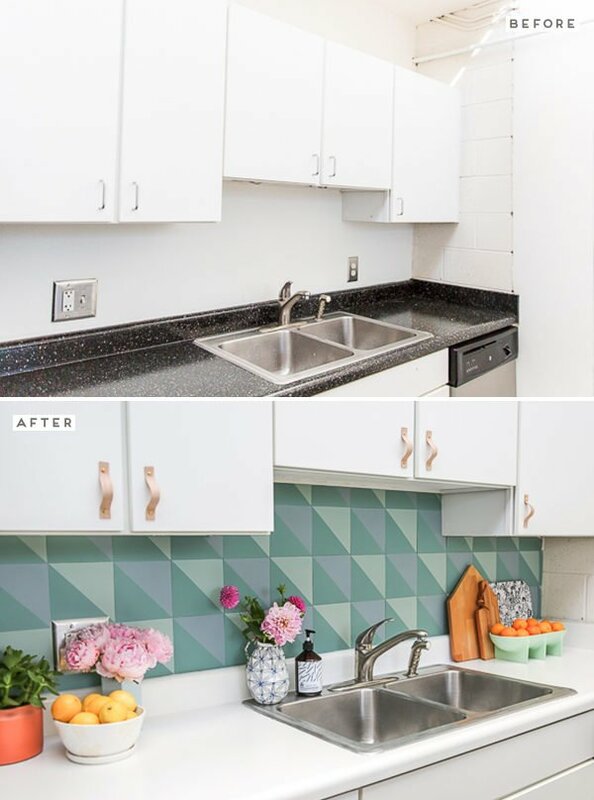 In between the before and after photos, I also switched out the cabinet pulls for a DIY leather handle and painted the countertops. 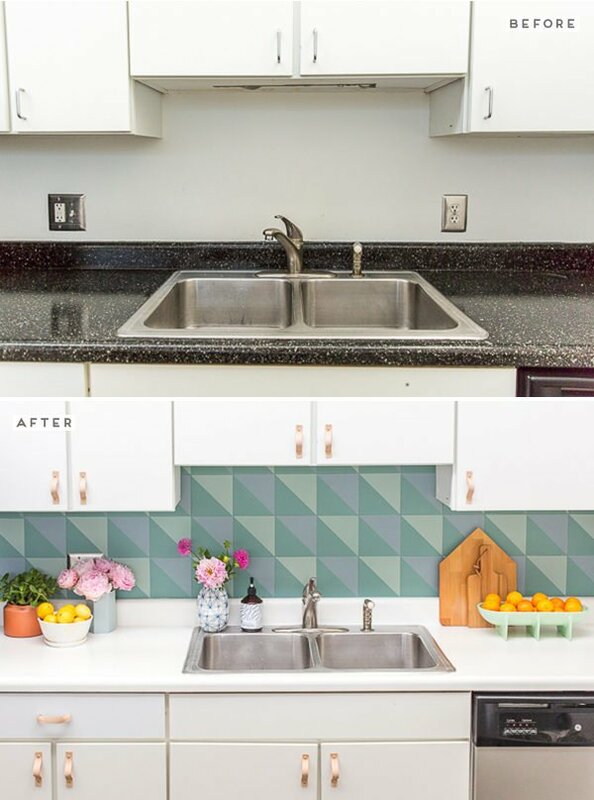 DIY on the countertop resurfacing coming soon! 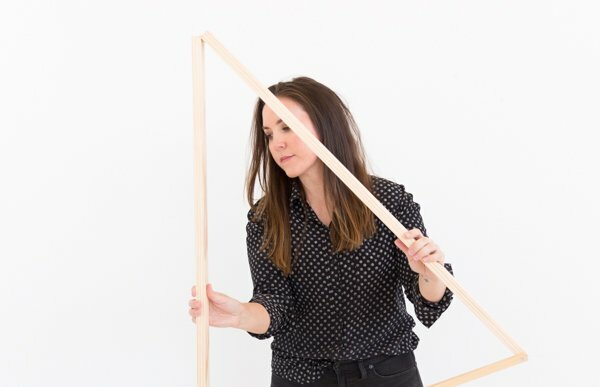 Not sure what kind of painter’s tape to use for this (or any) project? 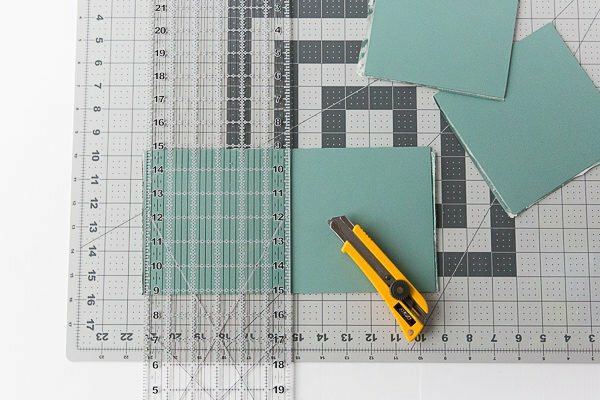 Use the tape selector tool on ScotchBlue.com/tapeselector to figure out the type of tape you should use for any project in four quick clicks. 1. 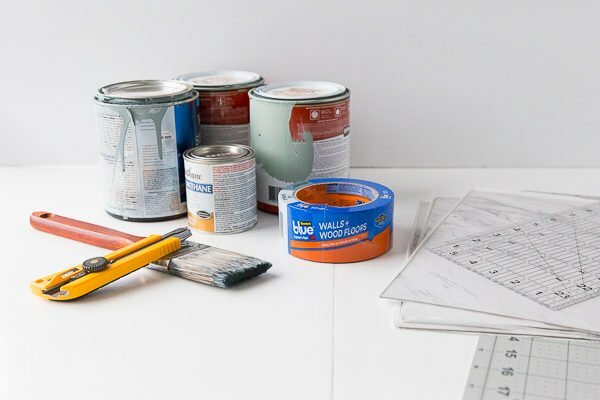 Start by painting the tiles a solid color. I alternated between using an earthy green and a grayish blue for the tiles. These colors will be the backdrop for your design. 2. Once all the tiles have been painted, set them aside and let them dry for 24 hours or more. Once given ample amount of time to dry, it’s time to cut them down into smaller squares. The peel and stick tiles I used are 12×12, so I cut each tile down into four 6×6 pieces. 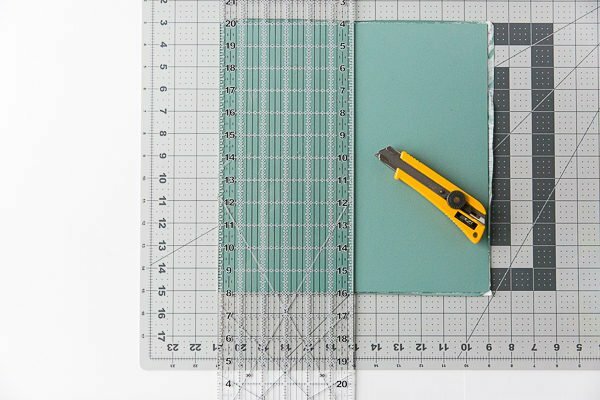 I happen to have a crafting ruler that was exactly 6 inches wide, which made things super easy for scoring. I just lined up the edge of the ruler with the edge of the tile and scored the tile, using the ruler as my straightedge. You don’t have to press down hard at all for this step. It’s just to get a score line. 3. Once the first line is scored, bend the piece in half at the score line and it will break with a clean edge. You will have to do a quick score line on the back of the tile after it’s been bent, since the peel and stick paper backing will still otherwise be attached. 4. Now, take one of the two pieces that have been created and mark off and score the second line with a sharp blade, just as you did the first. Bend on the scored line once again and score the sticker backing to separate the pieces. 5. Since your background layer of paint has now had plenty of time to dry, it’s time to add another layer. 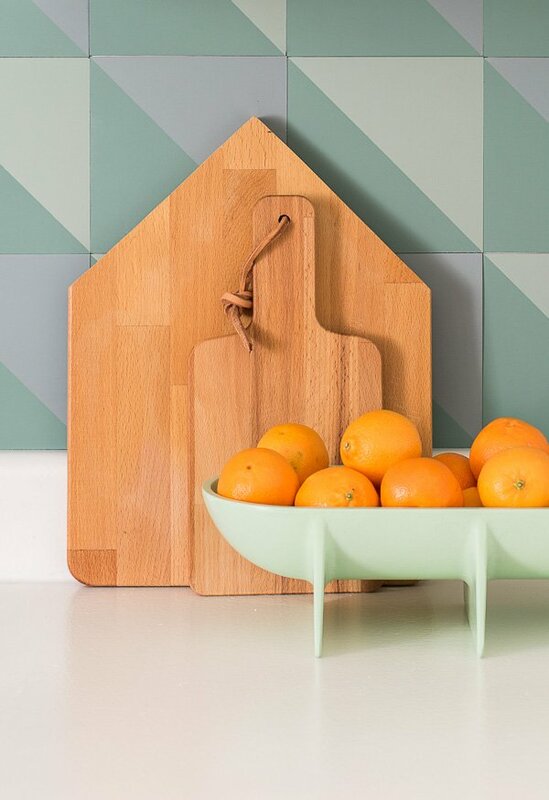 To create a simple triangle design, like mine, tear a piece of ScotchBlue™ WALLS + WOOD FLOORS Painter’s Tape that is longer than what you’ll need and line it up on the two corners of the tile, as shown in the photo. 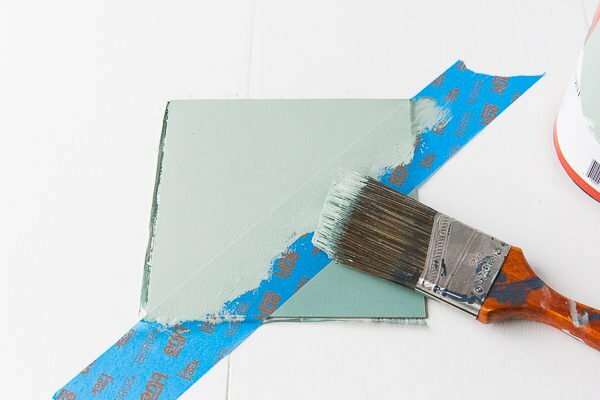 This tape is the best one to use for freshly painted surfaces that are at least 24 hours old. Press down firmly across the entire surface and again once or twice on the outermost edge that will be touching the next layer of paint to make to get that super sharp paint line. 6. 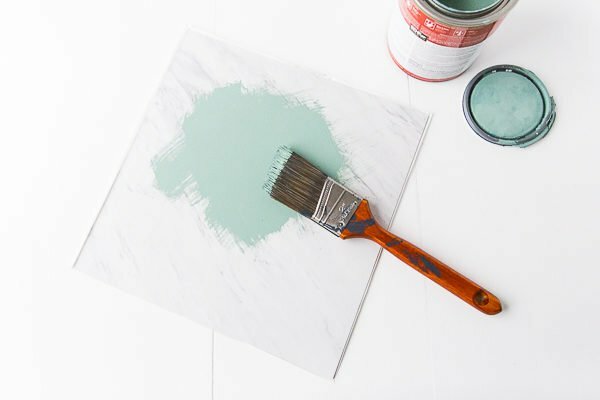 Paint the exposed part of the tile with a contrasting paint color. 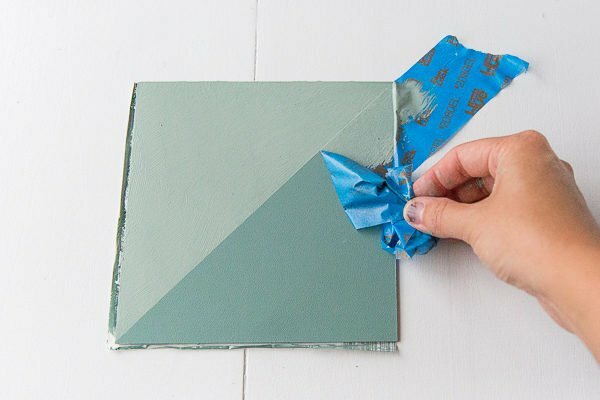 And then remove any excess paint from the tile and tape (just go over the surface with a dryer brush a few times) before removing the painter’s tape slowly at a 45° angle and pull the tape back onto itself for best results. It’s more important to remove slowly than to get that exact 45° angle, but why not do both. FYI – For this particular project, I found that removing the tape as soon as possible gets you that super sharp paint line. 7. Set the tile aside to dry and repeat the steps with the remaining tiles. I ended up using roughly 50 tiles for the finished backsplash in my kitchen. Once the tiles have had time to dry, apply a thin coat of polyurethane, and set aside to dry once again. 8. Install! Make sure your wall surface is clean and free of debris; then remove any outlet covers. Next, once your tiles are completely dry, remove the paper backing from the tiles and get to sticking. It might help to make some level lines on the wall ahead of time, to use as a guide. 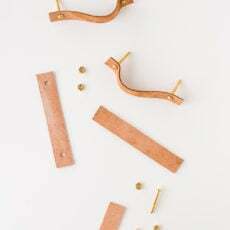 And when you get to any areas that need to be custom cut to fit, you can mark them off with a pencil and score them the same way as the earlier steps. P.S. I’m thinking this idea would be super fun to adapt into floor tiles too. What do you think? Would you be interested in a tutorial for that if I came up with some new pattern ideas? Let me know. This post is in partnership with 3M. All opinions are my own and additional products used in the project were selected by me. 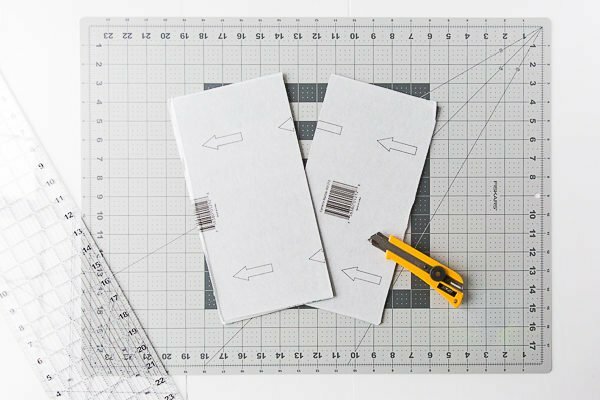 Thanks for supporting the brands that help keep Paper & Stitch running. I love how this turned out, Brittni! Do you know if you can lay the vinyl tiles on top of ceramic ones or do you need a smooth wall? That’s a great question Kimberly. 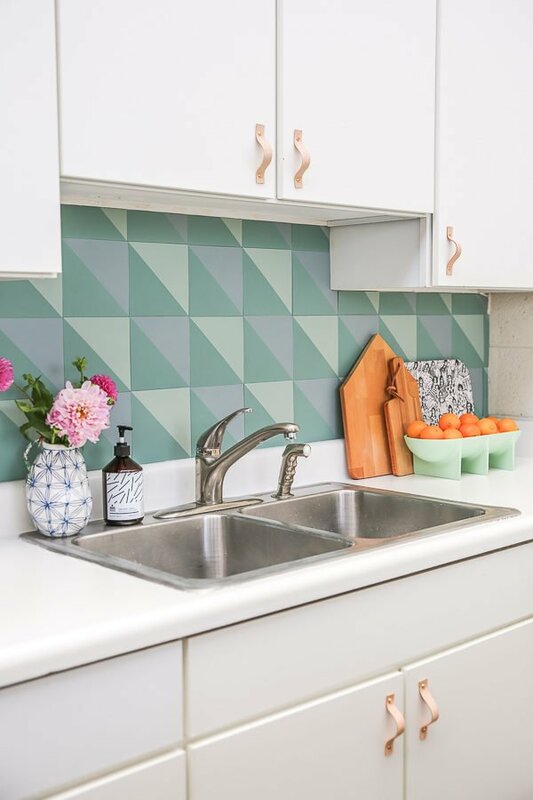 If the grout lines are flush with ceramic tile, than you’d have a solid, level surface for the vinyl and you could definitely apply these tiles right over existing tile. If the grout lines are not flush with the ceramic tiles you have now, you’d want to test out just a few tiles first to see how well they stick / camoflouged what’s underneath. 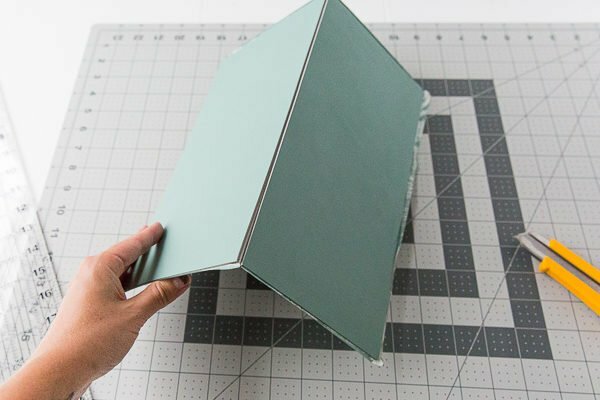 My assumption would be that you can do this without removing the paper backing on the vinyl, but just laying a few pieces out and taping them down on the unearth part and stepping on them to see if they end up denting into the grooves, etc. Hope that helps! This transforms the whole kitchen in an amazing way, so cool! Thanks so much Michelle. It’s been a good, budget-friendly option so far. Wow that backsplash is so adorable. I love the colors! Thanks Courtney! It turned out better than I had anticipated and is holding up really well so far (it’s been almost a month now since I put this up). This is SO pretty! And definitely a lot more durable/longer lasting than the removable sticker tiles meant for renters! I may actually give this a try. Thanks! Thanks Rebecca. Let me know if you give this a try! I’d love to see how it turns out. Love this! 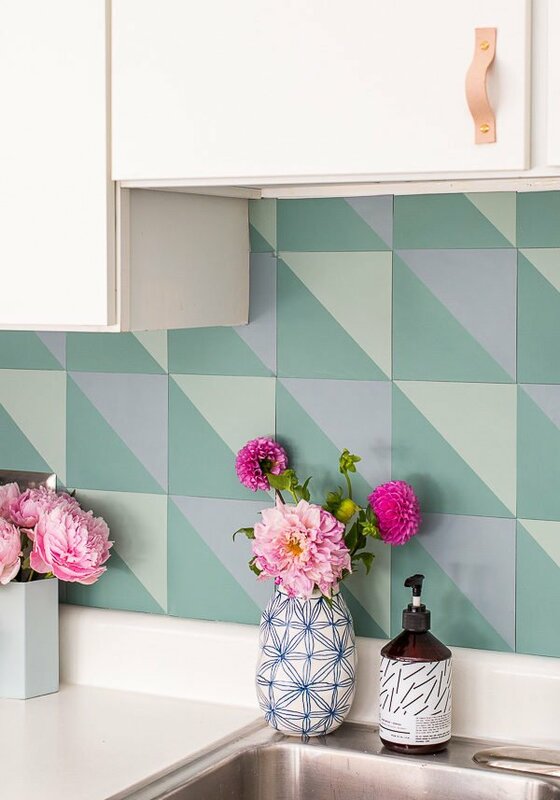 As a renter whose kitchen has no backsplash tile, just a plain white wall, this seems like an interesting solution… Do you know how these tiles would be to remove once I move out? Hi Shannon. If you’re renting, I would recommend getting approval from your landlord for this before sticking the vinyl sticker backing directly onto drywall, so that you won’t have to worry about removal when you move out and it can stay up. The sticky backing is strong and could (in some cases) cause damage to drywall when removing. SO, as an alternative solution for renters, if you want something more temporary that you can easily remove at the end of your lease, you could keep the paper backing on the tiles (or use tiles that don’t have a sticky back) and attach them to the wall with something more temporary, that’s completely damage free – like sticky tack, tape, etc. Hope that helps! I totally need to do something like this in our house! Our backsplash is so plain and non-existent! Let me know if you end up giving this a try, Paige. I’d love to see how it turns out. Thanks, Brittni, for your quick response. I just might give this a try. 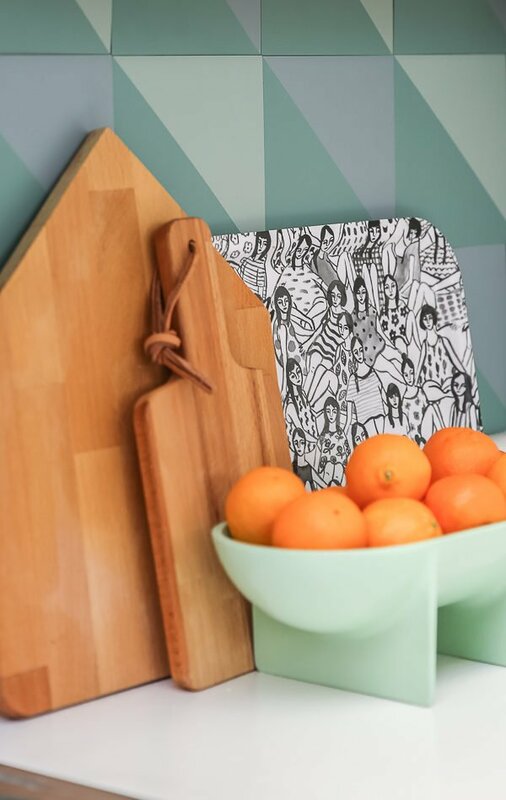 I’ve been wanting to change my kitchen backsplash and love this budget-friendly option. I really really love the colorful outcome! Those greens and blues work really well together. Wow, what a difference that made! A pop of colour goes such a long way. I love it! What a coincidence. I’ve never met anyone that spelled it the same way as me. Cool! And yes…the fruit container is from a local shop in Atlanta called Youngblood https://youngbloodboutique.com and the brand is Sandwich Shop. Looks great! Is it possible to do it with kids?